I've already written a tutorial on how to connect Samsung Galaxy S5 to your HDTV using both wireless and wired connections. However, I find it necessary to provide you all options you can choose from so you can mirror your phone's screen to your TV set in a way that's convenient to you. In my previous post, I pointed out the use of Samsung AllShare Cast Wireless Hub and the special adapter that's also from Samsung. This time, there's still one device from Samsung but the other two maybe any brand as long as they support screen mirroring feature. Priced at $299, this accessory would make it easier for you share your multimedia files from your Galaxy device to a larger screen via NFC. The brand of the TV doesn't matter here as long as it has an HDMI port. Step 1: Connect one end of the HDMI cable to the HDMI port on the HomeSync and the other end on the HDTV. Step 2: Plug the cable of the power adapter to the power port on the HomeSync and plug the adapter to the power source. Step 3: Press and hold for 3 seconds the Power button of the device to turn it on and let it initialize. Step 4: Now, turn on your HDMI and set it to stream pictures via the HDMI port you connected the HomeSync to. You will see the HomeSync easy setup page, follow on-screen instructions. Step 5: Make sure the Galaxy S5 is connected to a Wi-Fi network and that the NFC is enabled. Place the phone upside up on top (center) of the HomeSync device. Step 6: The phone will automatically open Samsung Apps and direct you to the HomeSync download page. Step 7: Touch the Free button and then the Accept and Download button to begin installation of the app. Step 8: Once the HomeSync app has been installed, touch the two devices together again, and then launch the HomySync app from the Galaxy S5. Step 9: Enter the Wi-Fi network password on your phone. Step 10: If you want pictures from your phone automatically uploaded to the HomeSync device, touch Yes when prompted. Otherwise, touch No. Step 11: You may be asked to update Samsung Link so media streaming could work properly. If so, touch Yes to update. 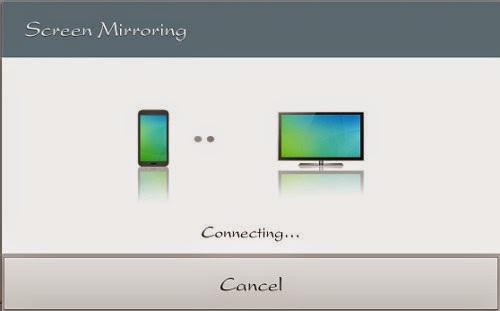 Step 12: On the Home page of the HomeSync, touch Screen Mirroring to display your mobile phone's screen to your HDTV. And that's it as far as screen mirroring via HomeSync is concerned. I am familiar with the Belkin Miracast Video Adapter so I will be using it as an example on how to mirror your Samsung Galaxy S5's screen to your HDTV. Currently, this dongle is offered $69.49 at the Amazon.com, so it's a lot cheaper than the Samsung HomeSync. Step 1: Plug the Miracast Video Adapter onto the HDMI port at the back of your HDTV, then turn your TV on. Step 2: On your phone, swipe down from the top of the screen to pull the Notification Panel down. Step 3: Tap the Quick settings icon located on the upper right-hand corner of the screen. Step 4: Tap Screen Mirroring to turn the feature on. Step 5: Now select your TV to connect and mirror your Galaxy S5's screen. That's pretty much it! Not only does the Miracast Video Adapter cheaper, it is also very easy to setup and use; it's basically just plug and play. Step 1: On your TV's remote, press the "Source" button. Or, if there's no source button, press any button that would let you select which source you want displayed on the screen like HDMI, AV, PC, etc. If you can see Screen Mirroring, then your TV is capable of this feature. Step 2: Select Screen Mirroring. You will then be shown a screen telling you that it's waiting for a device to be connected. More often, you have 2 minutes to connect your mobile phone before the scanning times out. Step 3: On your Galaxy S5, go to Settings > More networks > Screen Mirroring. Step 4: Select your TV to connect to it. Step 5: If it doesn't work, repeat the steps but this time go within 3 feet from your TV. As far as I know, there isn't no compatibility issues with this feature so any TV as long as it supports screen mirroring could work with your Galaxy S5. You now have 5 options to mirror your phone's screen to your HDTV. I've mentioned 3 procedures in this post and the other 2 can be found from this post: Two Ways to Mirror / Connect Samsung Galaxy S5 to HDTV.